Today my unborn baby turns exactly 11 weeks (Yay! One more week to go to cross the first tri-semester!) and I was actually scheduled to see my Gynae for regular monthly check-up this coming Saturday. However, I have been having mild diarrhoea since Sunday and practically feeling the horrible stomach discomforts all day long. I could not sleep well last night because my stomach was so much in agony. Therefore, this morning I asked my husband to take me to the hospital and see my Gynae slightly earlier than scheduled to make sure that everything was okay. Whilst I reckoned that my Gynae might not be able to prescribe any diarrhoea medicines because I am currently pregnant, I went to see her anyway just for the sake of my peace of mind. True enough, she just advised me to stick to bland food diet (otherwise, I will have to pay the price like now!) and prescribed me with some packs of oral rehydration salts to replace my body's loss of minerals in the past few days. Also, she told me to take one pill of Panadol to kill the stomach pain, if it gets too unbearable. No diarrhoea remedies given, as expected. 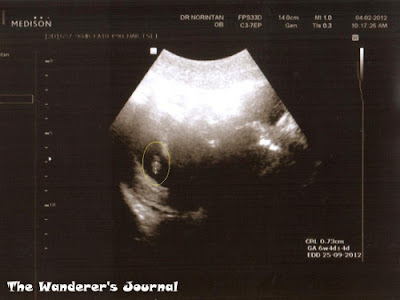 In yellow circle: My baby at 11 weeks. Anyway, on the bright side, I got to see my baby via the ultrasound scan again today and looking at how my baby has grown so much and moves actively inside me totally cheered me up (and eased my stomach pains a little bit). The baby even gave some water ballet shows for Mommy to see. My Gynae could not measure the baby yet because of the baby's funny position today, thus, she asked me to come back again on this Saturday to officially 'open the book' as per planned earlier this month. Doctor bills: RM 57.60 (for Gynae's check and the oral rehydration salts). I received a really nice surprise from two fellow food bloggers. 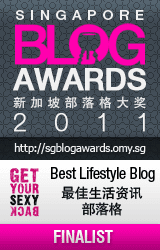 I was awarded with the Liebster Blog Award by Jane and Lorraine and the Boo, the Bear and the Goji Berries! Thank you so much, Dana of Jane and Lorraine and Ellie of the Boo, the Bear and the Goji Berries, for choosing me! I feel much honoured and delighted to receive this award from you. Go check their websites now to indulge yourself with some photos and recipes of sweet delights! So, here's a little background of the Liebster Blog Award. Liebster means 'Dearest' in German. This Liebster Blog Awards is all about rewarding your fellow bloggers for all the amazing work they've done with their blogs and those who receive this award are then supposed to pass it to some other blogs that he/she thinks are worth to read and follow! Thank the person who presented the Liebster Blog Award on your blog (it's common courtesy!). Link back the blogger who presented the award to you. Present the Liebster Blog Award to 5 other blogs of 200 (Google) followers or less, whom you feel deserved to be noticed because they run fantastic blogs! Let the selected bloggers know they have been chosen by leaving a comment on their blogs. Congratulations to the selected bloggers! I love baking marble cakes. Marble cake is generally easy and fast to make, needs simple ingredients (which are readily available in the kitchen) and more importantly, is always delicious to serve. I usually used this marble pound cake recipe that I have tested several times and my Mother-in-Law, in particular, loves this cake because it is so buttery and fragrant. This morning, I was itchy to bake a marble cake, as a little Sunday treat, for my husband and myself. However, this time around I didn't really want a pound cake. I wanted a marble cake with softer and fluffy texture. Pound cake has dense and heavy textures that often make you drink some water after few bites. I browsed several marble cake recipes in the internet and from my observation, most of the recipes are pound cake recipes. This said, I had to modify the marble pound cake recipe a little bit to achieve a softer marble cake texture. With the grand idea of making a soft marble cake in my head, which would probably require a lot of eggs, to my surprise, I only found two eggs available in our kitchen! I was like, WOW!, what would I do with only two eggs to get a softer marble cake result? Even the half recipe stated in the internet would require a little more than two eggs, I reckon. Hence, true enough, I had to quickly work a recipe out, on my own, to create a softer texture marble cake with only two eggs (while my husband was making a nice Spaghetti Bolognese for our Sunday lunch). Guess what, about an hour later, the marble cake recipe that I created turned out to be a major success! My husband loved it! The cake was so fragrant, buttery (but not greasy) and crispy in the outside but really soft in the inside. The only minor drawback was probably the fact that the cake was a little too thin even though I used a loaf pan for this. But seriously, I couldn't do much with only two eggs for the cake batter. Simple and soft Chocolate Marble Cake I made today. So, without further ado, here's the marble cake that I created today. To make a taller marble cake, simply double or triple up the amounts of the stated ingredients below. 80gr Unsalted butter, at room temperature. Line the base of the cake pan with parchment paper. Thinly grease the side parts of the cake pan with margarine. Set aside. Preheat the oven to 150 degree Celcius. Mix the flour, milk powder and baking powder in a dry bowl. Set aside. Cream the sugar, vanilla extract and butter until soft. Slowly add the eggs onto the butter mixture and keep on mixing with high-speed electric mixer until the batter is well incorporated. Slowly fold the flour mix into the cake batter with spatula until it's well incorporated. Take about three spoons of the cake batter, put it in a separate bowl and incorporate it with the cocoa powder. Pour the white cake batter into the lined cake pan. Add the chocolate cake batter on top and create pattern with a chopstick. Bake the cake in the preheated oven for about 25 minutes. A really nice marble cake with only two eggs! The inside look of the soft marble cake I made today. This evening my husband purposely took some photos of his pregnant wife as keepsakes. 8 February 2012: Me at 8 weeks pregnancy. In the photos above, I am two months pregnant with my first child and my tummy has shown a little bit as if I just ate too much fish ball noodles. I asked my brother in Indonesia to help me edit the photos because I don't have the software and good skills to do so. He indeed helped me a lot in improving the photos' contrasts, brightness, etc. since the photos we snapped this evening were taken under not very good lightings. Thanks for editing these pictures, bro! By the way, I have previously shared that my younger brother in Indonesia is an avid young photographer and takes really good pictures. Therefore, I would really appreciate if you could support his works by clicking "LIKE" on his Facebook page. Many thanks in advance for your kind supports! Finally, my baking mood is back! This evening (after a long day dealing with my endless work), I decided to make mini cupcakes for my nephews who happen to stay over our house for a couple of days. Yep, I had the mood to entertain them too today! I used Joan's chocolate cake secret recipe for the cupcake. I have tested this recipe many times and am always so pleased with this chocolate cake final results. It just never fails me! Mini Strawberry Chocolate Cupcakes with sugar star. As for the cupcake frosting, initially I was planning to make both strawberry and chocolate cream frostings to decorate the cupcakes but I felt kind of exhausted after dinner so I ended up creating just the strawberry cream frosting. For the strawberry cream frosting flavour and pink colour, I mixed a little bit of Hershey's Strawberry Syrup, which once used for the 'door games' at my wedding in Malaysia last year, into the basic cream frosting mixture. Mini Strawberry and Chocolate Cupcakes with edible silver ball. Mini Strawberry and Chocolate Cupcakes with pink flower. Oh well, my efforts in baking these mini cupcakes despite my strong will to rest this evening were not in vain at all. My eldest nephew really loved them and ate most of them. Then, he asked my Mom-in-Law, "Why Aunt Christine didn't make a Happy Birthday Cake for me recently?" Honestly, I forgot about his birthday. Oops! My eldest nephew found the joy in eating the mini cupcakes. After dinner, he ate five of them for dessert. Moving on, as per my Mom-in-Law's suggestion, I packed one big cupcake and three small cupcakes for his school's lunch box tomorrow. I am very happy to see him eating my cupcakes like that - I take it as a form of appreciation! Sorry for only showing my mini cupcakes pictures here, without the recipe. I have to do this because I used my friend's secret recipe and I guess I am not supposed to share secrets, right? 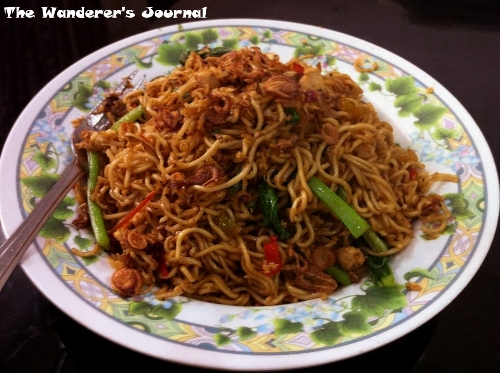 I have been craving for a plate of Javanese Fried Noodle for quite some time by now. Being a foreigner in Seremban makes it difficult for me to find some good authentic Indonesian food nearby. Therefore, at times, I would have to hold my Indonesian food craving until my next visit to my home town or cook the food myself. Since my Mom-in-Law is away for a couple of days and today is a public holiday in Malaysia, I decided to make my own style Javanese Fried Noodle for lunch, which happens to be my husband's favourite too. I asked the basic recipe from my Mom in Indonesia last week then modified it a little to make it spicier and tastier. Javanese Fried Rice/Mie Goreng Jawa: My first successful attempt. Grind the spice paste ingredients and set aside. Heat cooking oil in a large wok and scramble the egg. Sauté the spice paste until fragrant. Add in the chicken fillet cubes, chopped tomato and green mustards. Add a little bit of water and mix well. Put the boiled noodles in the wok and add the sweet soy sauce and seasoning sauce. Cook until all the ingredients are well incorporated. Taste the fried noodle and add a little bit more salt or pepper powder when necessary. I am glad that at least my mood for doing some simple cooking is back and my first attempt in making Javanese Fried Noodle this afternoon was not disappointing at all. This fried noodle was spicy, savoury and salty enough. Everything turned out just nice and my husband totally loved it and ate most of it! Today I am 7,5 weeks along with my pregnancy and was scheduled to visit my Gynae again after my first meeting with her ten days ago. My husband and I came to the hospital at about 8am plus and surprisingly; we were the second patient this morning! This said, we decided to skip our breakfast, albeit my screaming stomach, and preferred to finish our meeting with the Gynae. At about 9am, we finally got to see the Gynae again. As planned, she did the second ultrasound on my tummy to find the baby. 30 seconds passed. We saw nothing. The Gynae kept on moving the transducer around the lower part of my tummy but she could not find a thing. Not even the picture of my amniotic sac. One minute later, still nothing. All of sudden, I got pretty scared. Finally, the Gynae gave up and told me two things in order to detect the baby inside my uterus. One, she would need to ask for my permission to do vaginal ultrasound. Two, I would need to drink a lot of water to produce enough fluid in my amnion sac, which would make it more visible via ultrasound scan. First option was obviously a big no-no to me. The thought of having the invasive vaginal ultrasound on me was really creepy and unimaginable. In the end, we decided to go for breakfast first and make me drink a lot of water, then come back to see the Gynae about 30-45 minutes later. After breakfast, we saw the Gynae for the second time this morning alone. She attempted the ultrasound scan on my tummy again and after a difficult search, we finally managed to see the baby! Just for one time. After that, the Gynae was trying hard to look for the baby again but apparently, the baby was just too shy to show us his/her body for the second time. Seemingly, my baby inside the uterus moves a lot, like every second. That's why; we could not find him/her again. My Gynae gave up again and asked me to come back one month from now for the third scan. 7 Weeks and 3 Days: Meeting my unborn baby (in yellow circle) for the first time. Today marked the first time that my husband and I saw our baby and I was just so blown away with this experience. I was really grateful when the Gynae finally found the baby inside my uterus through the ultrasound scan and said that everything was fine. Also, I can't stop smiling looking at my baby's pose today. 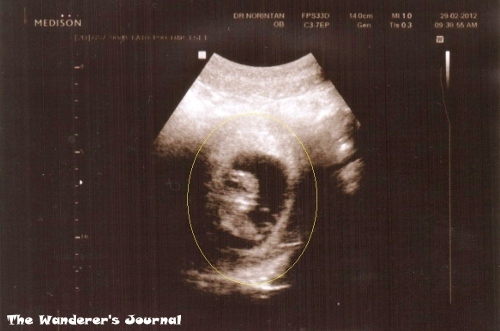 In the scan photo, the baby really looks like a Sea Angel we once saw in Sentosa's Underwater World in Singapore. But seriously, it's just surreal to be able to grow a human being inside me and I am really thankful for this, despite all the pregnancy symptoms that I have to date. The nausea feeling has somewhat magically gone this week and I am praying for this peaceful feeling to last until the end of my first tri-semester and later. The Gynae mentioned that nausea is actually good for the baby's development because that means I have enough pregnancy hormones. But no doubt, it's torturing me. Craving for literally a lot of things and could not stop thinking about food, even at night. Unable to sleep well throughout the night. The Gynae mentioned that this symptom is very normal for the first tri-semester. It will be gone by the second tri-semester but will come back again for the third tri-semester. Duh! And oh, she emphasized that after I give birth, I am confirmed to bid farewell to my good night sleeps. Tell me about it! Feeling weird uncomfortable sensation in my stomach during my sleep time at night. It feels more like an indigestion problem or something. Experiencing frequent urinations, especially at night. Feeling dehydrated most of the time. I really appreciate the goodness of plain mineral water these days and totally love drinking it. Can't stand the smell of fried fish and hence, do not feel like eating it too. I really feel dizzy when my Mother-in-Law starts frying meat or fish in her kitchen and the horrible smell fills the whole house. Finding the joy in eating savoury and salty BBQ Potato Chips and French (or Curly) Fries although I know I should limit consuming this junk food due to its soaring high fat, salt and MSG contents. The lower part of my tummy has somewhat grown bigger and I really need to start shopping for bigger pants real soon. Gained about 2 kg so far. That's about it and my next Gynae appointment would be next month. Next month, my pregnancy would hit the 11th or 12th week and by then, the Gynae will officially 'open the book' for me by starting to periodically chart my weight, blood pressure, baby size, etc. They just do not do all these recordings for pregnancy under three months. More updates then! Doctor's bills: RM 243 (for the Gynae's consultation's fee and Duphaston/the progesterone tablets).